I had dinner in Highland Park last weekend with the Bulletin’s RC Now blogger, Wendy Leung. Not only is RC Now your top source for Rancho Cucamonga news and views, it’s often darn funny even if you don’t care about Rancho Cucamonga. Well, I can only imagine it would be — who doesn’t care about Rancho Cucamonga? Wendy had a coupon from the Good Girl Dinette, a restaurant that is said to meld Vietnamese dishes with American comfort food. I’d been there a couple of times for lunch and liked it. Even better, it’s only a couple of blocks from a Gold Line station. We had Vietnamese spring rolls, spicy fries with garlic and a soy-based dipping sauce, and two pot pies, one chicken, one vegetarian. The pot pies are one of the restaurant’s signature dishes. They were curry-like, came in a dish and had a biscuit-like top. We liked all our dishes. 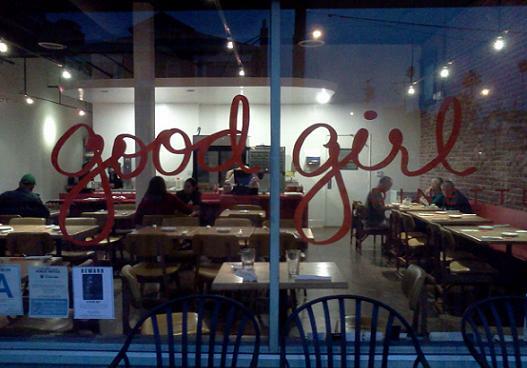 Good Girl is on LA Weekly’s LA99 list of great restaurants. We met there early and by the time we left, near 8 p.m., the place was nearly full. I’ll have a third and final (?) blogging-related meal in L.A. to post about as soon as the other blogger finishes his writeup and I can link to it.